RAWALPINDI (92 News) – Chief of Army Staff General Qamar Javed Bajwa visited ISPR on Friday. 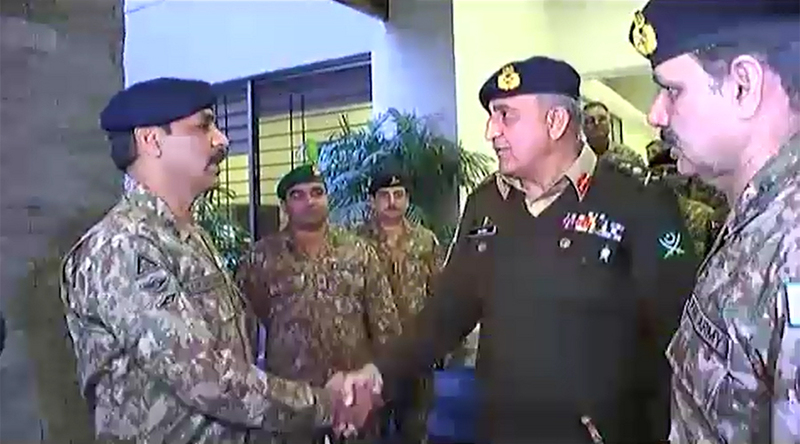 The COAS also interacted with the ISPR officers and staff. Lt Gen Asim Saleem Bajwa, outgoing DG ISPR, briefed the COAS on the role and functions of the ISPR. COAS General Qamar Javed Bajwa appreciated the role of ISPR as an institution. CGS Lt Gen Bilal Akbar, VCGS Major Gen Azhar Saleh and DG ISPR-designate Major Gen Asif Ghafoor were also present.